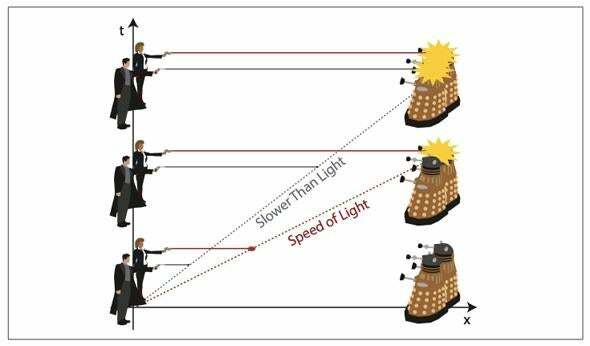 Relativity: An explanation via Doctor Who. River Song’s laser has an advantage over Captain Jack’s gun when it comes to Daleks and space-time diagrams. Are you a Doctor Who fan? Are you also scratching your head over how relativity works? Then do I have a paper for you: “The Blue Box White Paper”, an explanation of how space and time work under the auspices of Einstein’s general relativity. The paper was written by two physicists who are experts in the field. * It uses various ideas from Doctor Who (as well as pretty funny illustrations featuring companions in various states of peril) to delve into the bizarre notion that space and time are intertwined, how you could (theoretically) move back and forth in time, why that’s unlikely, and what might happen when you do. It’s written clearly, aimed at an educated audience. I’ll admit I struggled with some of the more advanced concepts, but then, I tend to live my life in a linear, entropic manner. My experience in severely warped and/or punctured space-time is limited. And because why not, if you want a longer and eminently readable description about relativity, the speed of light, and how the Universe works the way it does, I highly recommend Why Does E=mc2? by my friend Brian Cox and Jeff Forshaw. I had a far better understanding of all these things after reading it, and it’s really a brisk and enjoyable book. *Haha! “Field”! I kill me.